Back From Colorado Springs and Michigan Is Ranked #8 In Both Major Pre-Season Polls? So I’m finally home from Colorado Springs and in the process of unpacking my whole life that I brought with me (aka I haven’t started yet). It’s even more sad that we finally moved out of the house on South Forest Ave after two years there. Literally had the perfect room setup, and now I have no idea how you are supposed to go out at night when you don’t live on campus. If you have any tips on making this adjustment, please feel free to share them. Insert the kid saying “get a job after college,” and have Adam Sandler imply you should stay in college and this is exactly how I feel. No wonder everyone said to enjoy college because afterwards it was all downhill, they were not joking. To make matters worse I hate change so much, it just makes this transition more difficult. My new roommates also don’t understand the concept of Traubing, which was/is completely mind-boggling. It is going to be a difficult tenure here, a real uphill battle, especially because I always feel like there were more things I wanted to do in college that I hadn’t tried yet, but I guess such is life. Now I just need to go to grad school…that’s somewhat like undergrad, right? Anyways moving on from my depressing take on life, these polls are why people voting should not have any effect on the National Championship, and why the media shouldn’t be allowed to award their own National Championship trophy. 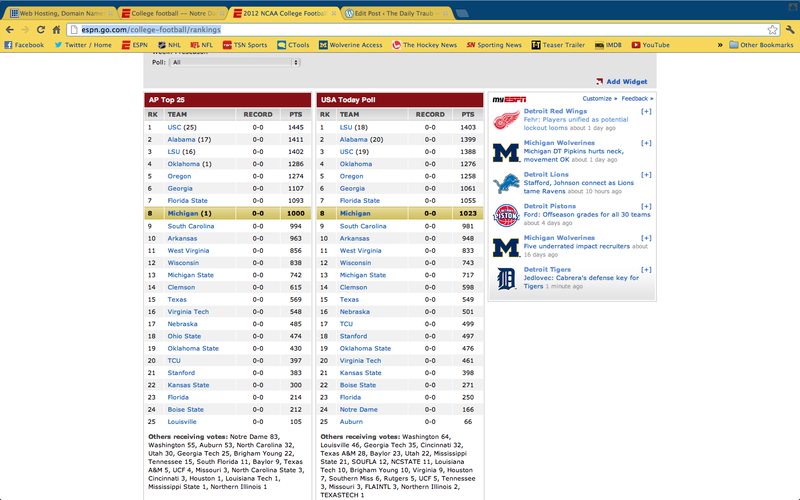 It’s completely ridiculous; Michigan ranked #8? Overrated. Michigan getting a first place vote? Seriously? I’m a bigger Michigan fan than 99.9% of the people I know/have met and if I think is ridiculous, than you know it is ridiculous. Ondre Pipkins just got hospitalized with neck injury, Chris Wormley tore his ACL, Frank Clark and Fitz Toussaint are suspended indefinitely, Roy Roundtree had arthroscopic surgery on his knee, Mike Martin, Ryan Van Bergen, and Junior Hemingway graduated last year, getting the picture? The first three players are defensive lineman that were going to help stem the loss of Martin and RVB, while Fitz is a 1,000+ yard rusher and the starting runningback, and Roundtree is the number one receiver that might not be ready to go by the time they have to go to Dallas, and he was supposed to replace Hemingway. Can someone explain to me how they are supposed to be ranked ahead of USC? Now I understand this is one person, but seriously, declaring them the best team in the Nation? On what grounds? This team has a chance to be worse than last year, their defensive line is in shambles, and games are often won in the trenches. Now I’m all for optimism, I think they could make an appearance in the Big Ten Championship game, that wouldn’t be out of the ordinary or the realm of possibility. But, how are they supposed to beat USC? They are the best team in the country, and instead of losing a key player like LSU did with Tyrann Mathieu, they went and added Silas Redd, a 1,000 yard rusher in the Big Ten. 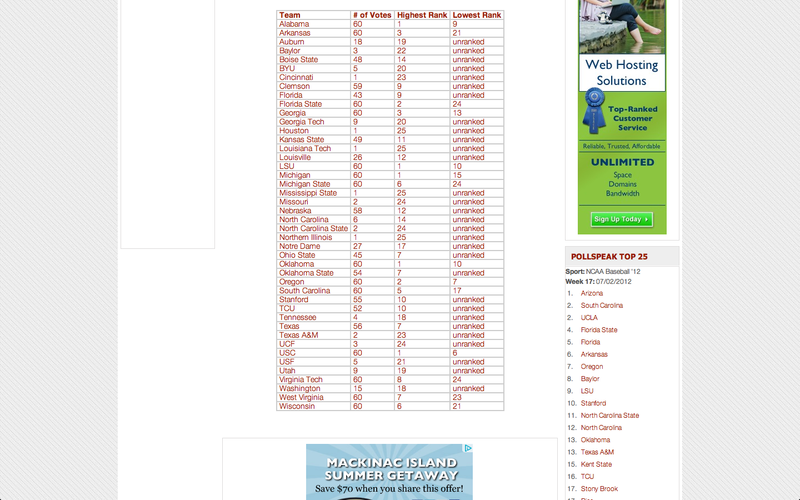 Here’s the top 25 for both polls for those of you that haven’t seen it. Seriously, I’m actually baffled. I get that they overachieved last year and they have Denard coming back, and their offense is mostly intact at the moment, but above USC? Above the reigning teams to play in the National Championship? Above Oklahoma, who returns a stud quarterback? I just don’t understand. How is this guy, Brad Asmussen, allowed to vote? 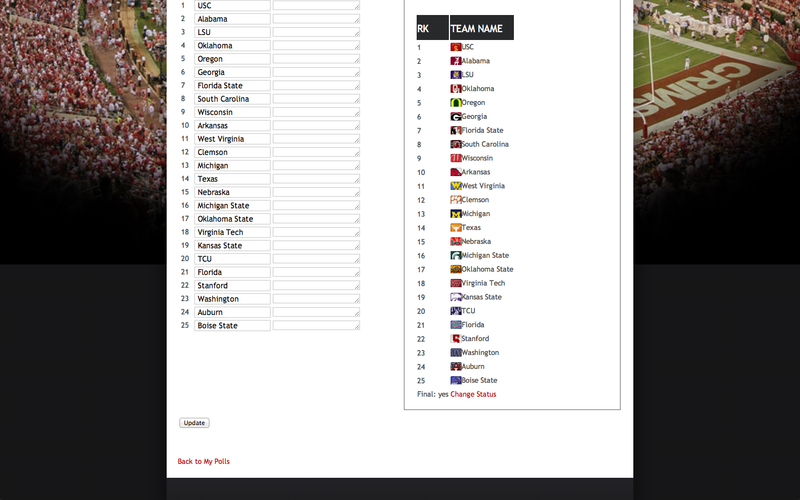 How do all of these writers get their college football voting rights? Because they understand grammar and writing techniques better than me and other people? What gives them their expert football “knowledge?” It’s a complete joke because most of these polls are a complete sham. And the worst part is the pre-season poll is extremely important, because if a team loses early but is ranked high enough, they could climb back into the fray if other teams lose late enough in the season. Just look at the highs and the lows each team received in the voting. I get it, people are entitled to their own opinions, but seriously, look at Florida State, one person votes them second and another votes them 24th? How is this logical? 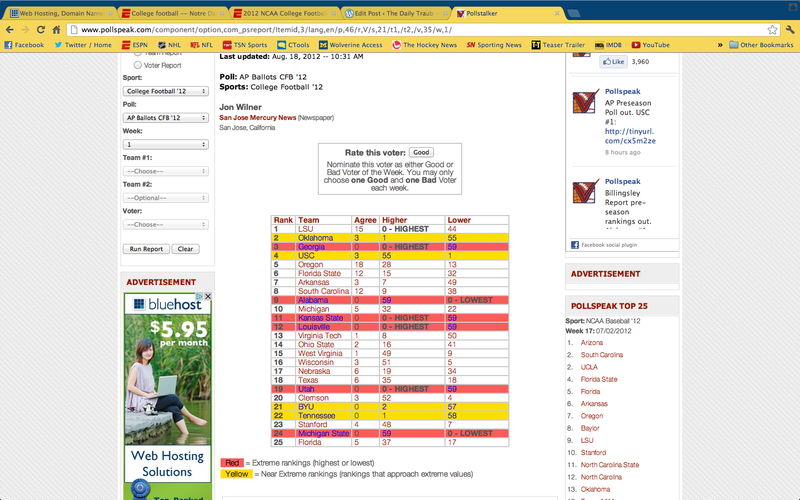 This next guys poll is so bad that I had to show you the whole thing, he makes Brad Asmussen seem almost sane. His name is Jon Wilner and he writes for the San Jose Mercury News and I think he has a degenerative brain disease. Here’s my poll for the upcoming season, took me about five minutes, but it just oozes logic and sanity, if I do say so myself. Anybody want to help me get a job working for a newspaper so I can spread my wisdom to the polls? Thank god they are switching to a playoff. This entry was posted in College Football, College Sports and tagged AP Poll, Brad Asmussen, College Football Playoff, Jon Wilner, Michigan Ranking. Bookmark the permalink.